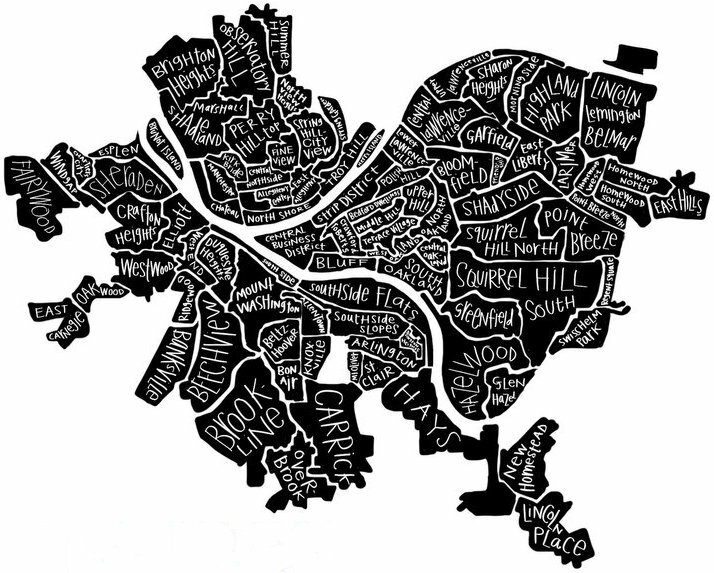 Officially, the city of Pittsburgh has 90 defined neighborhoods. We’ve set out to visit and report on each and every one of them, Orbit-style. Bean-counting readers will note that our full list of linked and not-yet-linked neighborhoods below doesn’t actually add up to 90. That’s because there are several larger neighborhoods/sections that the city has designated as multiple distinct neighborhoods. For our purposes, though, we aren’t going to differentiate two flavors of Squirrel Hill (North/South) or three of Lawrenceville (Upper/Central/Lower) and Homewood (North/South/West). Oakland and The Hill District are subdivided into even more official sections. We’ve made a couple other practical executive decisions like combining Arlington and Arlington Heights [P.S. how can you have “heights” if Arlington Avenue is already the top of the hill?]. On the other hand, we’ve given Duck Hollow and The Run their own bullet points, separate from Glen Hazel and Greenfield, respectively. Other tinkering with the list may yet occur. In any case, below is the full list we’re working from. For the names that have been hyper-linked, we’ve done at least one Orbit story that significantly concerns the neighborhood. Consider all others on the to-do list. Here’s where we could use your help: If you know of anything particularly Orbit-worthy happening anywhere–but especially in these un-covered territories–please let us know (via the Contact page).